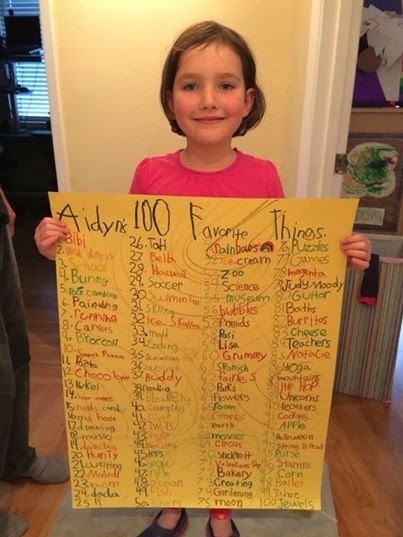 To mark her first 100 days of school my daughter made a list of her 100 favorite things. I am assuming these favorites were listed in no particular order seeing as how I was #23, and "Dada" was #24, while "Broccoli" and "Sweet Potato" made the top 10. However, just to be sure, my mom negotiated for the #1 spot. This was quite a process, this project of marking the 100th day of school. Most kids in her class just stuck 100 cheerios to a piece of poster board - breakfast and project - done. My daughter instead came home with the vision that she would draw pictures of 100 things that defined her. Creative? - yes. Narcissistic? - perhaps. Doable in less than a week? - NO FLIPPIN' WAY. Faced with what would be hours of work and an unlikely finish, I suggested that she compromise by simply writing 100 things about herself, which she translated into the idea of writing down 100 things that she loves. Still, this took some time - 100 is a lot, it turns out. First, it was thinking of the things, then it was numbering and writing them, and then it was tracing them in a variety of colors. Maybe this kind of project is what kids who go to fancy private schools do all the time, but for us, this was a big departure from the basic homework we are used to monitoring. In fact, faced with the prospect of hours of work that had to be squeezed into the short amount of time we have each day, I may have panicked a bit, hired the nanny for two extra hours a week, and otherwise brought in reinforcements (aka the grandparents). What are your 100 Favorite Things? Perusing this list I am struck by the signature of a healthy, balanced life, one that is in tune with both the physical and the whimsical, and one that celebrates the good things and the good times. A life lived with gratitude has been shown to be an amazing thing. Perhaps the exercise of making a list - be it of 5, 20 or 100 things that we love and are grateful for would benefit us all and help us to recognize the bounty in our own lives.